Onuga is the most delicious and cost effective alternative to caviar. 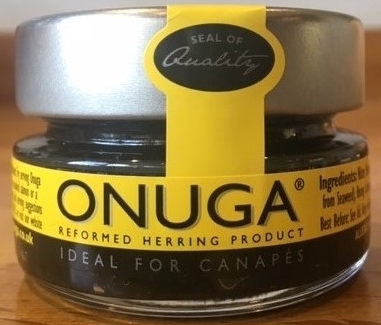 Made entirely from natural ingredients - smoked herring plus a little added salt, honey, lemon juice and seaweed - Onuga is ideal on top of canapés or fish starters. And because it's made from natural ingredients, there's no fear of the colour running. OK, it's not the real thing but at 3% of the price of Sevruga it won't burn a hole in your pocket. What's more, it's so versatile and easy to use. Simply pop some Onuga on top of your favourite canapés or starters and enjoy!